Prepare for some heated debates — or not — as the FIBBR Ultra Pro HDMI 2.0 Fiber Optical Cables arrive and I give them a good once over. Professional audio/video reviewers might consider that a formal evaluation of HDMI cables generates as much visceral excitement as kissing your elderly maiden aunt on her forehead. I would quite vigorously beg to differ. Over the past decade, the manufacture of HDMI cables that allow your expensive electronics to talk to each other has morphed into a multi-million dollar industry with new companies sprouting up every time you turn around. Do silver core cables yield better images or sonics than copper cables? This question might cause heated debates that can turn neighbor against neighbor and threaten the civility of traditional holiday gatherings. The answer to such questions may actually be neither of the above as the Chinese company FIBBR (pronounced “fiber”) has a product that could become the best solution for A/V system hookups. It has been known for quite some time that an optical fiber provides a very efficient means of sending high-speed signals over long distances. Mega-retailer Amazon has used fiber optical cable to improve the efficiency of its high volume Internet data centers. FIBBR cables exclusively offer leading-edge Fiber Optic Technology by YOFC. YOFC (Yangtze Optical Fibre And Cable Joint Stock Limited) is the World’s #1 Producer of Glass Fiber Cable and the FIBBR Ultra Pro HDMI 2.0 Fiber Optical Cable represents its first entry into the consumer electronics market. FIBBR proprietary BendRobust technology in action. silver core cables including anti-bending, low attenuation, environmental friendliness, and flame-retardance. Quartz provides the basic element for optical fibers and because it transmits light signals, it is inherently immune to electromagnetic interference, a real plus for audio and video signals. Fiber optical cables have lower wire volume and weight and higher flexibility making them easier to install in custom home theaters. 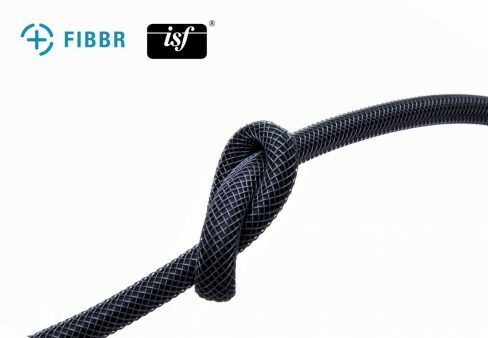 FIBBR Ultra-Pro HDMI 2.0 fiber optical cables also offer FIBBR’s proprietary BendRobust technology. 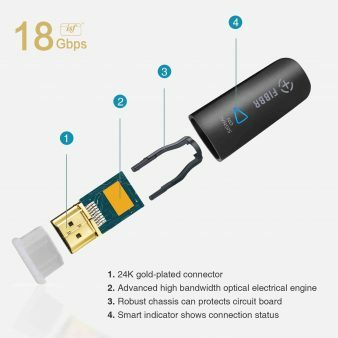 This technology, the company says, “allows the fiber to be bent 180-degrees, to guarantee flexibility and durability in extreme conditions with uninterrupted transmission of signals.” You also get ISF certification to reliably carry uncompressed, native 4K content at 18 Gbps up to 165 ft (50m) without loss or interference, so you can rest assured that all of your bits are arriving as they should. The introduction of 4K Ultra HD displays and source hardware has placed an increasing emphasis on signal integrity and the need for speed. In the past, I always used generic off the shelf copper-core HDMI cables for my A/V system. Discussions of cable speed and composition ultimately brought out the latent Luddite in me as I frankly considered that my “plain vanilla” cables were good enough to make the grade for 4K Ultra HD sources. My receipt of a pair of 2-meter long (lengths up to 50 meters are available) FIBBR Ultra Pro HDMI 2.0 fiber optical cables presented an opportunity to question my dogmatic cable beliefs. These cables are directional as clearly indicated on the terminals with a screen icon showing the end to be inserted into the HDMI 2.0 port of a display or surround processor. Once done, a cheery blue light on the source end appears, showing that the cable is properly connected. I began by connecting my Casablanca IVA processor and Sony XBR A1E OLED display. Later, to determine if there is a cumulative effect from having additional optical cables in the signal path, I connected a FIBBR Ultra Pro cable to the CB IVA, rotating it from an Oppo BDP-205 4K Ultra HD disc player, a Nvidia Shield Pro and Apple TV 4K. I was prepared to be skeptical while exchanging my standard HDMI connections for fiber optical cables. After all, there has been no shortage of “snake oil” products in the A/V high-end universe like “demagnetizers” for CDs or LPs or proprietary system “denoisers.” Here, the technology supporting the performance of optical fiber is quite solid and speed is an unquestionable virtue in the transfer of delicate audio and video data across very long distances. While cable runs exceeding ten meters are not uncommon for high-end projection video systems, many, if not most, home theaters center around flat screen displays where the video sources are not more than two or three meters from their respective HDMI inputs. The question that I put to these FIBBR cables was whether any video or audio benefits would accrue using the much shorter runs found in typical A/V systems. That question was rather quickly answered once the cables were put into place. While the 4K Ultra HD images were decent enough with my “plain vanilla” HDMI cables, the improvement in detail recovery, color palette, contrast, and depth of image was noticeable during the playback of 4K Ultra HD Blu-ray Discs with HDR10 and streaming 4K sources with HDR10 and Dolby Vision. These differences were particularly obvious in facial close-ups (beard stubble, blemishes, scars) and landscapes (verdant foliage, brilliantly colored plants). During this review I received a demo 4K video from FIBBR. Featuring a broad color palette, landscapes, and objects like assortments of food and flames, I got exactly the same impressions as with my previous video sources. Differences in the quality of audio signals were less noticeable but this was to be expected, as those sources are not as data-dense. If you have invested in an expensive high-end 4K Ultra HD display, it makes sense to reward it with HDMI cables that can exploit the virtues of all of those extra pixels and enhanced color palettes. While much more expensive ($149 each) than many off-the-shelf “high-speed” 18-gigabyte HDMI 2.0 cables, the FIBBR fiber optical cables are a perfect example of getting exactly what you paid for. Highly recommended. 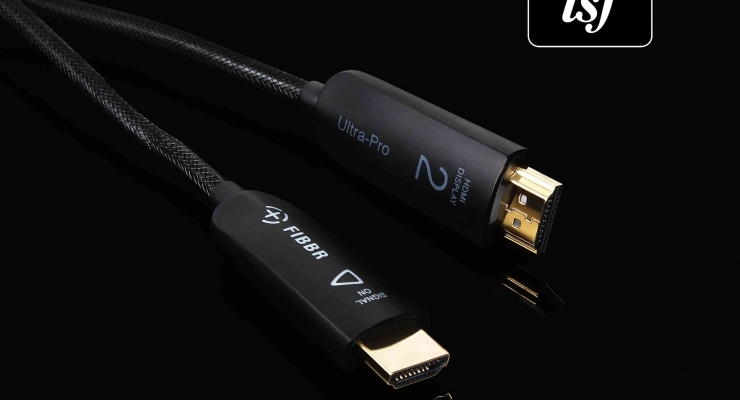 FIBBR's Ultra-Pro HDMI 2.0 fiber optical cables will get home theater owners to obtain the best pictures from their displays and video sources.